Nilgai prefer areas with short bushes and scattered trees in scrub forests and grassy plains. They are common in agricultural lands, but hardly occur in dense woods. The populations of nilgai in India are so large that farmers in the states of Bihar, Chhattisgarh, Haryana, Madhya Pradesh, Maharashtra, Rajasthan and Uttar Pradesh have pleaded to the government to cull them. They have become locally overabundant in these states, thereby causing seriousproblems which include damage to crops, economic losses and increased incidence of road mishaps due to vehicular collisions. 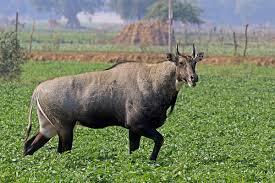 Nilgai caused extensivedamage to most agricultural crops. Farmers use live electric wires to guard their farms, which kills other animals as well. culling, building enclosures for the antelopes and fencing off agricultural areas as remedies for the menace.